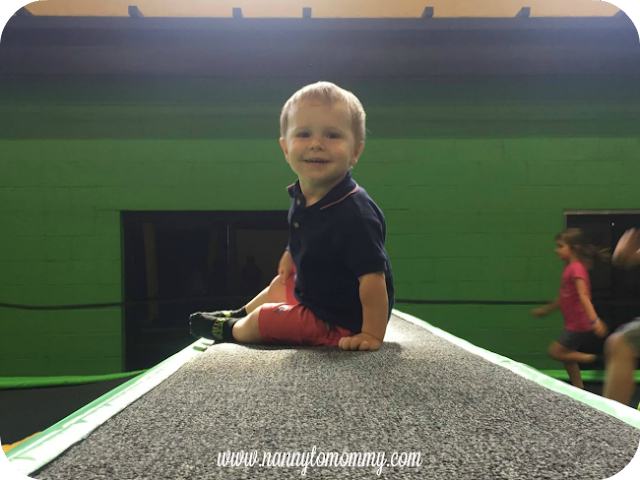 My son turned TWO! Where does the time go? His little personality is showing that he has definitely two. Others have told me that it tends to be a boy thing because he can get so aggressive one moment and then so sweet the next. Whatever it is, it's something new for me. With his wild personality comes other traits, like the fact that he sometimes seems so willing to learn new things and sometimes he's not. I want to start potty training soon, but I'm not sure if we are ready. Recently I was introduced to Personality Based Potty Training from Pull-Ups® . Pull-Ups® Training Pants partnered with child development experts to create and introduce the Pull-Ups Potty Partnership – a system that brings your child into the potty training process as a true partner, tailored to their unique personality and how they learn. I'm pretty excited about this partnership because we don't start potty training with ditching the diapers and getting some Pull-Ups® Training Pants. Step 1. Take the Pull-Ups Potty Personality Quiz to find out if your toddler has a Squirrel, Turtle, Puppy, Owl or Bear Cub Potty Personality. I took the quiz. 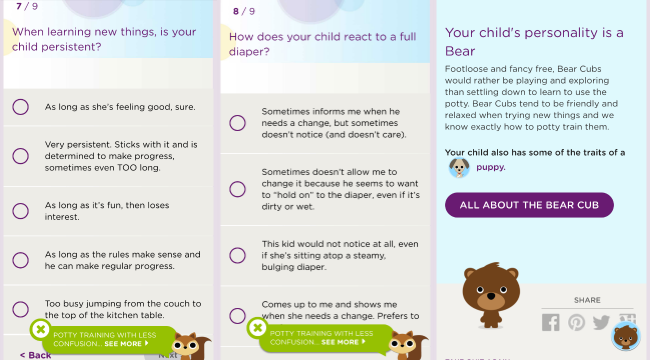 It asked questions about his personality and then more typical potty training readiness questions. My Peanut got bear cub with some traits of a puppy. Which I kind of figured. His personality means that it's time to wait. And that's okay. He just turned two and he isn't starting school any time soon, so we still have some time. I'm not worried and not rushing it. I learned that from my experience as a nanny. But I'm glad I took the quiz and got some kind of reference for his readiness. Step 2. Receive a comprehensive potty training program with tips, tools, and advice tailored to your child’s personality to help guide you and your child throughout the potty training journey together. Which is helpful even now because there are steps that I can take to help my little get ready for the process. Keep an eye on our potty training journey and how we are exploring the Pull-Ups Potty Partnership together. Participating bloggers are not responsible for sponsors who do not fulfill prize obligations. This giveaway is open to US only, must be 18+ to enter. One entry per household/IP address. No social media was involved in this giveaway in any way. Winner is chosen via Random.org through Rafflecopter. ALL winning entries ARE verified. Winner will have 48 hours to respond with all information in email or another winner will be chosen. If you would like to see your product featured in our upcoming Baby Shower Gift Guide or sponsor a giveaway event, please contact us. Your child's personality is a Puppy. No one is more eager to begin potty training than the Puppy! (OK, except maybe you.) This is a kid who wants to know how the Big Kids use the potty, and we know exactly how to help. Your child also has some traits of an Owl. Said she was a turtle with traits of an owl. Thanks for the giveaway! My grandson's personality is an Owl. Your Owl is determined, busy and predictable. Owls seem to notice everything around them; they make excellent sleuths, picking up on every little nuance. Let Pull-Ups deliver the training tools Owl will need to be a potty pro. My niece got, Bear. It also said, she has some traits of a puppy. My son got Bear. I sometimes think he is like the owl though. Pull Ups are such a great brand ! My son is a Bear. Footloose and fancy free, Bear Cubs would rather be playing and exploring than settling down to learn to use the potty. Bear Cubs tend to be friendly and relaxed when trying new things and we know exactly how to potty train them. My little guy got the turtle! Fits him perfectly! Haha, mine is definitely the bear. She is always ready for exploring and has no time to slow down. My son's personality is the squirrel. He is 24/7, non-stop, on the move! He has the personality of a bear. The owl, determined, busy, and predictable! Sounds about right! Your child's personality is a Turtle. My littlest is an owl with some little bear characteristics. The quiz seems to really nail-it on the personality. Awesome tools to have in the arsenal. Thanks! Your sweet little Turtle is content with the way things are now and rather resistant to change. Turtles prefer quiet activities and can be slow to warm up to new situations. Potty training is no exception and we know exactly how to get them going. My son got puppy with also some traits of a bear. My son has the potty personality of a squirrel! :) So true, lol. He does have some traits of a puppy as well. This is such a cute quiz! My son got turtle with some squirrel traits. He is a puppy but with some traits of a bear. This was an intersting quiz -- I hadn't thought about some thing in this way before.